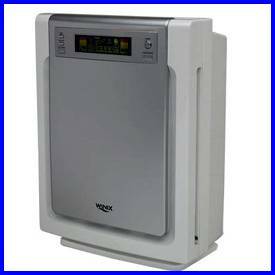 There is a tendency toward marketing with significant title inflation, but I couldn't fit the phrase "Winix PlasmaWave WAC9500 Ultimate Pet True HEPA Air Cleaner Review" across the page title. I wasn't sure exactly what type pet qualifies as "ultimate." Uh, actually, ultimate applies to the full set of filters and pet is another modifier. But despite the language barrier, Winix, a leading Korean manufacturer, has copied a premiere technology (Sharp Plasmacluster) successfully and taken significant market share. Winix uses several variations of the value brand theme, changing the filter stack and controls, but retaining the same or a similar fan/chassis and Plasmawave emitter. There are three Winix sizes, Size 25, Size 21, and Size 17. 9500 Pet is a Size 21 filter bay. Some are stripped-down, designed for big box retail at minimal price points. For instance, Winix removed the filter cassette tray system and the permanent mesh pre-filter to create the lower-priced variants in their 5000 series, like the best-selling Winix 5300. Before the advent of the Winix Signature Series, 9500 was a premium flagship model, with five filtering stages instead of two, and all the electronic options. The silver front panel is the major distinguishing feature from the predecessor 9000 model, which was metallic blue. After several years on the market, the Winixes have become an established brand, with a few still on ever-shrinking retail shelf space and a strong web presence. Sears, which has rotated through several manufacturers as suppliers for the "Kenmore" house brand, stuck with the Plasmawaves for several seasons. The WAC-9500's 4-star rating from AllergyBuyersClub.com staff is echoed by hundreds of user reviews at Amazon.com. That many buyer reviews indicate persistent sales. PlasmaWave 9500 has digital "smart" odor, dust and light sensors which raise and lower the low-voltage fan through 4 speeds when auto mode is selected. This allows the 9500 to idle quietly and efficiently while air is relatively clean, and speed up when odors or particles are near the machine. There is a wide range of user feedback on these inexpensive sensors. At this price compromises are required. For under $300, you are not finding a military-spec explosive-sniffing electronic nose included. The Winix 9500 will definitely detect strong odors in its immediate vicinity, but many users note that lingering distant odors may get missed. One user reports a quick response to burnt bacon in the kitchen while their Winix sat in another room. But smokers have reported delays up to two minutes in detecting a lit cigarette from across the room. Other reviewers say that the auto mode doesn't activate higher speeds often enough, that the pre-filter screen is too clean when checked after a month. "For the first 4 minutes after turning the unit on, the dust and odor indicators will flash while the unit measures air quality." This suggests the Winix is setting the air quality baseline. If this is done in a contaminated environment, the "normal" level will always be that dirty level. Powering the unit off after a few hours high speed operation may help "sensors seem insensitive" issues. Buyers should NOT expect to rely exclusively on Auto Mode, ALL air cleaners need to be run on high for considerable periods to actually clean the room. I recommend periodic "dust ups" - running an air cleaner on faster speeds for maybe 15 minutes, even though air quality has not tripped the sensors - at least once a day. The 9500s have an easily interpreted LCD display, with a timer button, a speed button for selecting low, medium, high and "turbo." Dust and odor sensors report their findings on a colored grid which changes from green to yellow to red as pollutant levels rise. Additional bells and whistles include a multifunction timer, programmable remote, and sleep mode. A unique light sensor puts the 9500 into sleep mode, dimming the lights and retaining low fan speed, when the room gets dark. But like other low-cost sensors, users have experienced issues with the light sensor. ..."every time I activated the "auto sleep" function, the purifier just went to the lowest setting regardless of how much light was in the room..."
Also, the lights can be dimmed, but not turned completely off for sleeping. The Ultimate Pet 9500 is AHAM certified with CADRs (Clean Air Delivery Rates) at 182 Dust, 194 Smoke, 183 Pollen. AHAM room size rating is 284 - far too large even for a plasma-ion machine. I'd install this air cleaner is a room of 180 square feet maximum - a decent sized bedroom. Note that the less-restricted (just 2 filters) but very similar Winix 5300 model has higher CADRs: 248 Dust, 235 Smoke, 251 Pollen. This says less about the Winix air cleaners than it says about CADRs, criticized elsewhere on this site. Testing at AllergyBuyersClub.com found the Ultimate Pet 9500 removed an average of 96.8% of all particles larger than 0.3 microns on the first pass. On the 9500 PlasmaWave, Winix includes a washable anti-bacterial pre-filter. This is the front fiberglass screen, which is one part missing from the pure-economy lower priced Winixes. While not entirely necessary, this is a convenient-to-clean fine mesh prefilter. The cassette tray provides gasket-sealed seating for a true-HEPA filter. This cassette is also missing from the budget-cutter Winixes. The pre-filter and carbon filter are scheduled to be washed every 3 months. I recommend vacuuming the prefilter monthly, to extend the longevity of the HEPA filter, at least until dust levels are low enough to use longer intervals. Replacement cassettes (Winix Size 21 #119110 Ultimate Replacement Filter), run $80-and-up plus shipping, about once a year. This seems a bit pricey and wasteful, since the entire cassette, with all 4 filters is sold only as a unit. I would immediately have to do a work-around on this air cleaner when the HEPA needed replacing. Note that the economy HEPA filter does NOT fit into the cassette tray, as numerous user reviews report discovering in dismay. Those wanting to save money can downgrade to the economy filter pack, but must discard the cassette tray to do so. Nano-Silver anti-microbial mesh comes next - another screen, but coated with silver particles one billionth of a meter in size, targeting the cell walls of bacteria which touch it. In my opinion, this feature may help suppress bacterial accumulation in the filter train, but is nearly worthless for interdicting disease. Flu and other viruses, and the majority of bacteria, are transmitted by direct human contact and sneezing, not by lingering airborne for air cleaners to capture. Winix in general is a bit light on carbon for odors. The top of the line washable carbon filter claims to be "Especially formulated to capture offensive Pet Odors...". But despite that claim, Winix 9500 has light activated carbon, and so is unsuited for heavy chemical, gas or VOC removal. Many air cleaner companies are struggling with filter odors in today's difficult market. Winix is no exception. See my Winix 5300 review for my Winix experience. "...a charcoal activated filter which gives off a medicinal, antiseptic smell which I find very objectionable. I took the filter out, and the smell is gone, but it also makes the fan sound louder." I also replaced a medicinal-smelling anti-microbial filter on my Winix 5300, and like it fine now that the issue is resolved. Over the years, these medicinal odor complaints have subsided. The last "stage" is the PlasmaWave plasma-ionizer. Winix's PlasmaWave ionizer, like its mentor - the Sharp Electronics Plasmacluster - emits both positive and negative ions. These create hydroxyl radicals from water molecules in the air. These radicals are powerful oxidizers, capable of destroying airborne microorganisms and volatile organic chemicals (VOCs). While Sharp has progressively increased the strength of their plasma-ion streamers, and added humidifier functions, Winix Plasmawave retains its original power - a bit less than the early Sharps. I have routinely warned Sharp users to avoid direct exposure to the plasma-ion stream, but often use my Winix 5300 with the streamer running fairly close to my desk. However, Winix has no negative-ion only switch. Competing plasma-ionizer builder Sharp has also left this very desirable feature off recent offerings. But do not believe the hype which suggests that a plasma-anything air purifier is a cure-all for a toxic home, as many do. Pollutant sources MUST be removed before installing an air cleaner. Plasma-ion oxidizers, when faced with a strong source emission, may create partially-oxidized by-products, further contaminating the space. Furniture should be refinished elsewhere, and fresh paint needs long periods to air out, please do not expect an air purifier to remove solvent vapors from refinishing jobs that should be done and cured out of the living space. The company website asserts no ozone is produced. Winixes are relatively quiet air cleaners. I can't find any company-published sound specs, but these numbers, for cubic feet per minute air flow and sound in decibels, appeared in a user-review post - they are consistent with my expectations. Sound Level (db) 36.2 / 43.9 / 47.9 / 61.8"
Users agree that Turbo speed is a bit loud, but have little notice of the 9500 on low and med speeds while sleeping. Like other plasma air purifiers, users may hear Winixes emit a ticking sound as the ionizers cycle on and off. This is a light pinging noise like metal contracting, but is not a sign of mechanical failure within the machine. Some AllergyBuyersClub.com user-reviewers, as well as many other reviewers, have reported PlasmaWave technology emitting subtle high pitched sounds. I am deaf in the upper octaves, and cannot hear either of these noises from my Winix. The WAC-9500 draws air from the front and exhausts straight up, creating few airflow issues. PlasmaWave 9500 is EPA EnergyStar certified, a DC Motor burns just 6 watts on low speed and up to 70 watts on turbo. The Ultimate Pet measures 16.5" x 8.9" x 21.9," and weighs a moderate 18.8lbs. While there is a remote receptacle, the lack of a handle molded into the case has caused some petite reviewers to complain of "wrestling" the 9500 up stairs. "If this air cleaner FAILS due to defects in material or workmanship within one year from the date of purchase, return it to place of purchase and you will receive a new one free of charge." In this value price class, there will be a certain number of defective units shipped. Note that the unit must "fail" to qualify for replacement, user dissatisfaction alone is not enough. One Amazon.com user review notes the unit was assembled minus one sensor. Others report prompt replacement of Winixes that failed within the warranty period. WAC9500 is the upper end of the Korean value brand's sales proposition. I feel that cost-cutter versions better exemplify the value in the Winix nameplate. There will be occasional issues with Asian-built economy air cleaners, a certain percentage of quality control misses, and new anti-bacterial filter odors will displease some. I would avoid paying full $299 suggested retail, and especially avoid the brazen ripoffs at a few vendor sites ($479.98! ).